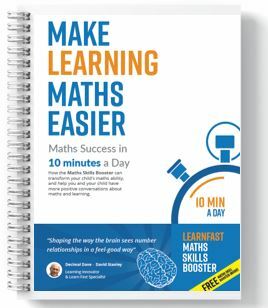 The Make Learning Maths Easier Book is written for home-schooler and other parents. will this get better or worse as they progress through their education? 10-15 minutes, 5 days a week. Tap into the power of the 'reward economy' for an essential performance boost. Make Learning Maths Easier will not only help with learning maths, it is also a positive parenting tool - it provides you with lots of opportunities to celebrate learning success and the measured improvements your child is able to make happen. Allows the child to measure and see their improvement. Enables parents to have positive conversations with their child about maths – even if their child has really struggled in the past, they can see and feel improvements every month. The Make Learning Maths Easier Book is available in softcopy and hardcopy.